Here's a terrific, groundbreaking martial arts epic that marks the directorial debut of master fight choreographer, Corey Yuen (aka Yuen Kwai). The film begins in Feudal Japan where rebellious young ninja, Jin Wu (Hiroyuki Sanada) has been slaying samurai and goverment officials left and right. By doing so, he has understandably placed his family's life in danger. Wu leaves with his wife to China in order to hunt down the man who was responsible for his father's death. The man in question Fukuda, is living peacefully under the name Uncle Foo. He has a young upstart protege named Jay (Conan Lee) who is always finding ways to get into fights. Jin eventually finds his target. It is revealed that he was not Jay's father's killer, but rather deserter in battle. Disgraced with this revelation nevertheless, Fukuda/Uncle Jin makes ammends with the wronged ninja by taking poison. This leads to a misunderstanding with Jay (who is understanably upset seeing his mentor dead at the apparent hands of a Japanese). After battling each other to a draw, the two disparate fighters manage to settle their differences just in time to deal with a spiritual boxer (Hwang Jang Lee) who's son Jay had insulted in a previous battle. Though the basic story of a young fighter seeking revenge for the death of his father is probably the oldest cliche in the book when it comes to kung fu films, what makes 'Ninja in the Dragon's Den' so innovative was it's casting of a Japanese character and actor in the lead hero role, a first and pretty extroadinary given China's (and the rest of Asia's) general dislike and distrust of Japan. The result made this film hugely popular not just in Hong Kong, but with decidedly fickle Japanese audiences as well. Corey Yuen is one of my favorite action chreographers. After this film, he went on to direct modern Hong Kong actioners, 'Yes Madam' and 'Righting Wrongs' (both co-starring American female martial artist, Cynthia Rothrock) before eventually setting his sights on America by directing/choreographing 'The Transporter' (set in France) and choreographing countless Hollywood production like 'Romeo Must Die' and 'Lethal Weapon 4'. Yuen has this unique ability to build forceful fight scenes that can ultimately leave audiences feeling drained. He has consistently brought out the best in his actor/fighters from Rothrock to Jason Statham. His work here though grounded more in traditional martial arts as opposed to street brawling, still leaves his edgy, high impact stamp. Hiroyuki Sanada and Conan Lee (in his debut) are excellent as the embattled protagonists. Sanada was Sonny Chiba's top student and really gets to show off his fighting and acting skills as well as gravity defying stuntwork, arguably more so here than in any of his homeland productions. Conan Lee was being billed as the next big star and if only he hadn't let early success get to his head, he likely would have fulfilled that promise. His early fight scene done completely on stilts (!) is one of the most memorable in all of kung fu cinema. Korean born Hwang Jang Lee is perhaps the baddest kicker/leg fighter that has ever lived. He doesn't get to show his stuff quite so much here as in previous appearances, but he is still plenty formidable as he takes on both heroes at once in the finale (a trade mark of his). Sadly, said finale is marred somewhat by goofy, misplaced humor on the part of the villains. Though the comedy aspect of the film had been prevailent throughout (the stilt fight in particular), it is pushed just a bit too far in the end which dilutes it's impact. 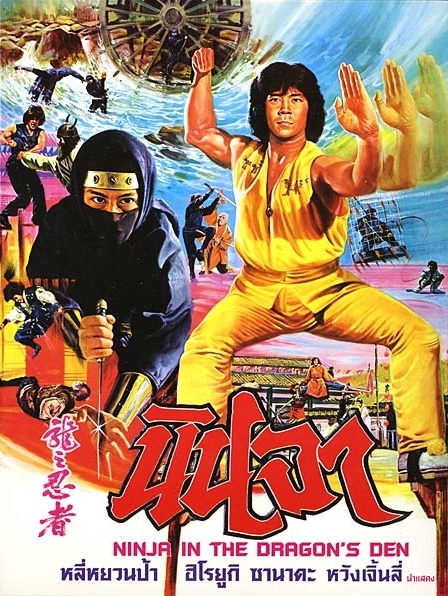 Nevertheless, 'Ninja in the Dragon's Den' remains a high flying visual feast for fans of the genre and would make for a top introduction for those unfamiliar with the plaesures of old school kung fu flicks and want to give them a try. Review: Lego Minifigures Series 9, Part One. Review: Doctor Who Character Building Series 3!